I am delighted, that this vehicle offers me the opportunity to give voice to my message of love, on this auspicious day of the return of Venus and resurrection of the Goddess on planet earth. This is Mary Magdalene, also known as ascended mastress Lady Nada. Today, I speak as the daughter of Venus that I am. I and my beloved twinflame, beloved Jeshua came to planet earth in times of great darkness to assist our beloved brother, Sanat Kumara to guide our younger sister Lady Gaia through her birth into a radiant star of oneness. This has been a long journey and many of you beloved hearts came along with us as venusian starseeds to anchor the paradisean codes of unconditional love on this planet, as well as many other starseeds from other ascended star systems such as the Pleiades, Arcturus and Sirius, which are all 5 dimensional. We agreed a long time ago to bring this planet back on its orbit, as she had gotten out of tune and lost sight of her destination after the fall of awareness, that took place in Atlantis. Every single being on this planet carries the seed of paradise, the seed of unconditional love in their heart. And through this long awaited Venus transit, this seed will be brought into full bloom now like a beautiful rose. It is the return and resurrection of the goddess within your heart. This venus transit is also a trigger to remembering the androgynous being that you are and it will indeed catapult you into great change now. Not only in your relationship with yourself, but also in your relationship with others. You will transcend the limitations of gender, you will transcend the limitation of separation from your godself and remember your androgynous nature. And with these changes you will start to remember not only who you are, but why you came here and naturally act upon it as your monadic godself. You will be propelled and initiated into your divine purpose and planetary mission. And trust, beloved one, if you are supposed to be here on this planet according to your soul’s plan, there is no way that you will miss any hint given to you by your soul, as to how, when and what to do. This will simply happen without you having to give any thought to it. You will no longer consider IF you should change your job, IF you should leave your relationship, IF you should move to the destination of your heart… you will simply find yourself there, even before you have decided to make the necessary change. Because the universe will cater for these things to take place by connecting you with the divine blueprint of that exact reality of your soul plan. And everything will manifest with ease and grace… that is… if you allow it by trusting, that whatever is happening in your life, whatever changes that seems to be forced upon you, are according to your soul’s plan and in coherence with your deepest heart desire and mission on this planet. By being fully present and available to this present moment, these changes will happen within a very short window of time and you will hardly be able to resist or doubt, as the dominos of your soul plan pick up momentum and propels you into your new life, destination and mission. You have come a very long way. Many of you feel worn out and tired, which is due to the pivotal changes taking place within your body and within the planetary body itself, which in truth is ONE. In this last phase of the mayan cycle, you are literally transmuting thousands of years of distorted energies within a very short timeframe increasing exponentially month by month as time is non-linear and the avancement of the light quotient within these last months and the next to come, is catalysing this immense changes on all levels of your being. And soon you will no longer see yourself as human beings, but as multimensional eternal beings beyond any limitation… something that some of you can barely dream of now. However there are those who still live in denial and resist with all their being these great changes coming upon them. Do not worry for those, because everyone has their own individual timing for their awakening and through the enhanced light quotient, those who are destined to be here, will awaken, when the mass quotient needed for mass awakening and ascension is reached. So there will be no one left behind, no one who will miss out on anything. Because everything will happen according to divine plan. So please be patient with those who still resist, do not put any pressure on those still in resistance, as this will only increase their fear and resistance to change. Encourage them through your example of living through your heart and going with the change and flowing with what is presenting itself in the now. Let silence speak through your heart to those who resist to hear. The coming weeks up to the solstice will present you with enough opportunities to make the needed changes and release all that, which you deeply know does not belong in your life anymore, all that which is no longer in alignment with who you are becoming. So you may use these weeks to honor that which needs to be released with ease and grace… not to say that this is the last opportunity, there are always more opportunities, however in this period of time you are offered smooth waters and calm balancing energies to clearly see where you need to make the changes. And when the great portal of the solstice opens whatever has still not been released, will simply be flushed away… likened to a tsunami that takes everything with it, that no longer belongs in your life. So it is indeed your choice beloved one, whether you want it in the soft way or whether you prefer the swift rough tsunami to capsize your life, because that is what it will do. But as already mentioned, it will only remove that from your life, which you on soul level already has decided to let go off to move into your souls mission here on earth and only that which is according to your divine plan will happen. So please take this opportunity beloved ones and let the waves of change come into your shores and remove all that is no longer in alignment with who you are becoming and which is not belonging in your new life. You are brave ones indeed and you are all great explorers of the unknown and every single one of you have the needed strength and courage to move through these unsettled waters of transition to find the calming waters of the new heaven on earth within your hearts. No matter what happens in your life, beloved ones, encounter it with love, encounter it without judgement, encounter it with faith and you need not fear anything that happens to you or to your loved ones. There are no mistakes being made. Everything, every single event is happening according to divine plan and is orchestrated by your soul and monadic family of light. Just love with all your heart every single moment of this wonderful journey into oneness, into your christed self. You have already arrived, beloved ones, though some of you may feel far away from the state of peace that you are so longing for…. harmony and unconditional love and oneness which is who you truly are. In truth you are already there. You have long past the point of no return. Allow yourself to be there now…. in your vibration…. allow yourself to be nourished by your fully awakened christed self standing beside you within just a hand’s reach, waiting for you to merge with it. On this day I ask you, beloved ones, to consciously connect with the goddess within, the divine feminine, welcome her return and offer her back her throne, offer her trust, offer her respect, offer her your worship and she will resurrect and in doing so the scale of ying and yang will come into balance. The divine masculine will step back and offer her space beside him and return her scepter and they will embrace in a sacred union, in an alchemical marriage and merge into one. And your kundalini will awaken fully and activate and trigger the opening of the thousandfold lotus in your crown and you will merge with you monad and return home to who you are, to unconditional love and oneness. 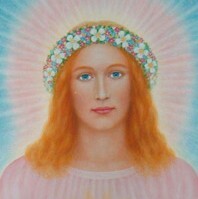 I am Mary Magdalene and I thank you with my heart for listening to my message and for taking the opportunity to love, with all your being, all that you are and all that is happening in your reality and accepting it all as divine. You are all jewels of the same diamond in the heart of God. Be blessed beloved hearts.